Wolf has recently released its new ATEX LED Leadlamp SP-600, a cable-powered, lightweight hand-held light with impressive LED light output. 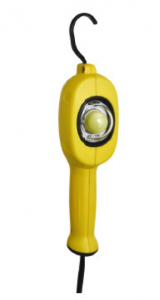 Its outstanding light output makes it ideal for inspection and work activities in hazardous areas. The high power LED ‘fitted for life’ light source produces a forward facing high efficiency output of up to 470 lumens. The output is an exceptional, even, ultra-wide-angle light that minimises shadows and enhances visibility to provide optimum illumination for localised, close proximity work. Lightweight, compact and ergonomically friendly, the Inspection Leadlamp is designed for handheld use, with an “easy-grip” handle for user comfort. The SP-600 has a flexible 360 degree swivel hook used for suspending, so hands-free use can be achieved – plus there’s magnet mounting accessories available. The unit is extremely robust with an impact resistant anti-static enclosure, IP67 rated. Furthermore, the polycarbonate hardcoat lens is scratch and chemical resistant to withstand the rigours of heavy industrial use. The cable-powered Leadlamp is available in three voltage input ranges: high voltage 90-264VAC for general applications, and low 18-54VAC/20-54VDC and extra low 9-16VAC/DC voltages for use in confined space applications, such as metal tanks. Rating: The SP-600 is CE marked to the ATEX Directive and is IECEx Certified safe for use in Zone 1 potentially explosive gas, where a T4 temperature class permits, and Zone 21 potentially explosive dust atmospheres, with a maximum surface temperature of 950C, as well as Group I mining applications.